No need for a physical music library when you have your iPad handy! If you’re a musician, there’s no longer a need for three-ring binders crammed full with music sheets. You can use your iPad and a great music reading app to store all of your favorite pieces and anything else you might be working on. Here are the best music reading apps for iPad! forScore really is the perfect sheet music app for your iPad. It can import just about and PDF and it connects directly to storage services, like Dropbox, so you can import all of your music and have everything you need right on your iPad. You can also keep things organized by tagging files, which forScore then organizes automatically within its menus. You can even create setlists to play through, which is perfect for gigs. If you need to make notes as you’re playing, you totally can, with drawing presets that you can create yourself. You can use forScores stamps or draw and import your own. You can then share everything via email, AirDrop, or Bluetooth, and the pages turn themselves! If you’re looking for the utmost in sheet music reading, organization, and annotation, then forScore is certainly the app for you. piaScore is available for both iPhone and iPad and has features that benefit both platforms. 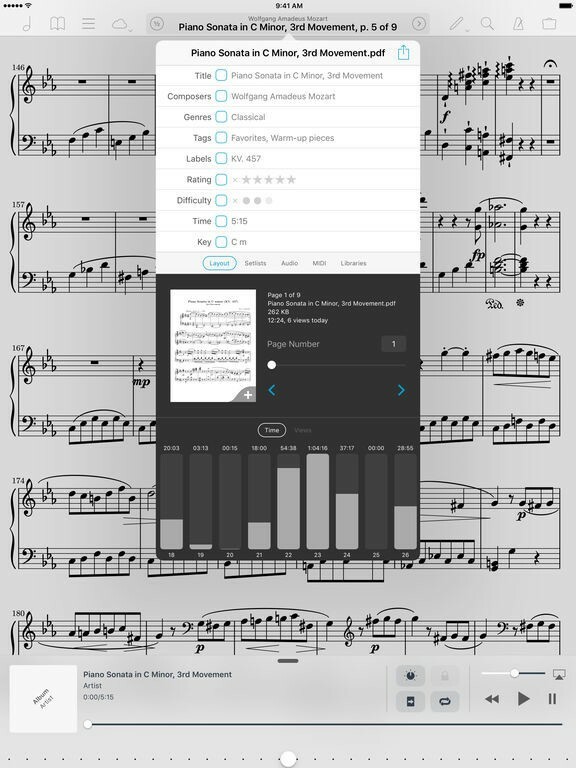 You can annotate your sheet music to your heart’s content, search using the app’s smart browser, and even download free scores from 70 thousand works and 7,800 composers. You can also import PDFs, so that you all of your music is literally at your fingertips. Like forScore, you can also create setlists and tag files so that your library is organized the way you want it to be. The best part of piaScore? It’s free to download. There are various in-app purchases for certain tools and sheets, however, in case you want some premium features. Symphony Pro is not just for reading, since it lets you create your own music, either with your QWERTY keyboard or a MIDI input device. There are 114 built-in instruments to choose from when you want to play back and audition your compositions, and there are a ton of tools, gestures, and shortcuts to make creating and editing that much more efficient and powerful. You’ll want to read the App Store description of this one to see just how much this app can do, since the list of features is enormous. You can import MIDI, MXL, MusicXML, and Symphony files, export in a variety of formats, record parts, back up and sync your scores with iCloud, and so much more. If you want to create your own sheet music on top of being able to read everything you have already, then Symphony Pro is where it’s at. Forzando makes learning easier, since it’s both a PDF reader andan MP3 player. Using the free companion desktop app, you can transfer all of your sheet music over, along with the corresponding MP3s. You can even associate each MP3 or M4A file with a particular score so that you don’t have to go searching for them separately when it comes time to practise. You can also listen to note sequences and use the 13-note keyboard to find pitches. Forzando also lets you annotate scores in different colors and layers, and there’s even support for Apple Pencil. In order to add PDFs and MP3s to the app, you need the desktop client (free). the best music reading apps for iPad!